With Nero Platinum 2019, you can manage your everyday digital life, at home and on the road - guaranteed! 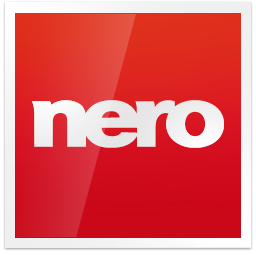 Nero MediaHome 2019: In Nero MediaHome, you can now access your OneDrive online files (Files On Demand) and download them directly. This saves a lot of storage space on your PC and you still have your pictures, videos and music directly available for your project at any time. And of course, you can play everything in the usual way, whether it's a video DVD, music CD, music files, photos, slideshows, videos, films or TV series. Stream your photos, movies and TV series including movie titles wirelessly to TV in your living room. Nero DuplicateManager Photo 2019: Have you lost track of your photo archives on your PC? Multiple copies of duplicate photos and so many similar photos through image editing or HDR? Nero DuplicateManager Photo's brand new'Find similar images' mode provides quick help. It finds duplicated and similar photo folders and photo duplicates quickly and securely, restores order to your photo archive, valuable storage space, and even cleans up your Nero MediaHome media center. Nero Burning ROM 2019: A class of its own. 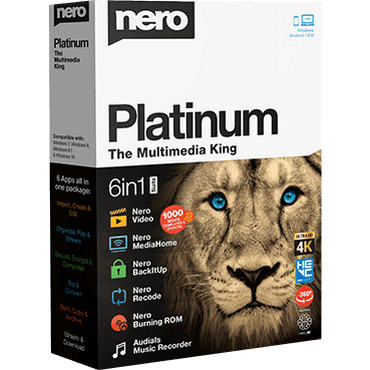 Whether CD, DVD, Blu-ray Disc™: Copy and burn precious data with the proven burning specialist in Nero Platinum 2019. With SecurDisc 4.0, including 256-bit encryption, password protection and disc optimization technology, you can also rest assured that your files will last a lifetime. Even burn audio CDs with automatic sound enhancement and album art. Audials Music Recorder: The Nero Music Recorder included in Nero Platinum 2019 is your ticket to the world of music: Listen to the hits of your favorite bands and discover new songs by accessing over 100,000 online radio stations and thousands of concerts, music videos, and fan content. Music Recorder records music as a non-DRM-protected MP3 file. These can then be copied to your mobile device.